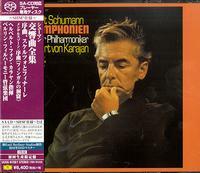 The 4 Symphonies; Berlin Philharmonic Orchestra, Herbert von Karajan, conducting. Two SHM Single Layer SACD set. The four symphonies by Schumann, more than those by Schubert and Mendelssohn, seem to be works of sheer will-power by a compositional mind that never quite functioned comfortably in the conventional four-movement patterns of the form, writes The New York Times. Still, the musical content is so vital that these four works have always been immensely popular. Karajan provides something approaching a definitive statement in his complete traversal on DG, molding the frequently intransigent material into cogent, ripely romantic performances.